What happens when a former Hippy starts a company in Kauai? This question might conjure images of someone hand weaving hemp clothing on the beach. In the case of Becky Burns, Founder of Anahola Granola, she melded her love of Kauai and healthy eating into an an International brand. Becky is one three Kauaian entrepreneurs I reached out to, in the hopes of better understanding how they established thriving businesses on a tiny rock in the middle of the Pacific. All three Kauaian entrepreneurs I spoke with share a love of Kauai and volunteer their time to preserve its history and enhance their local communities. Vance Pascua has created the Ainofea (I No Fear) clothing brand, to inspire Hawaiian youth with a positive alternative to the “I No Care” mindset. Sheri Trentlage has been dubbed “Indiana Jane” due to her historical research, which has rewritten the history books regarding Europeans’ first contact with native Hawaiians. Growing up, Becky Burns spent her summers on Orcas Island, part of the San Juan Islands archipelago in Washington. Her family valued independence and self-reliance, which came in handy when Becky moved to Hawaii in the 1970’s and lived in a tent on Molokai, tending an organic garden and goats. When she started Anahola Granola on Kauai in 1986, she was an anomaly, as few Kauai women were starting businesses. She quickly learned to be patient, respectful of the island ways and accepting of the challenges of island life. Becky has always been a proponent of eating a healthy diet, long before sustainable, healthy food and granola was hip. She baked her first granola batch in 1972, when she lived in a log cabin as the caretaker of Sheep Island off the Washington coast. 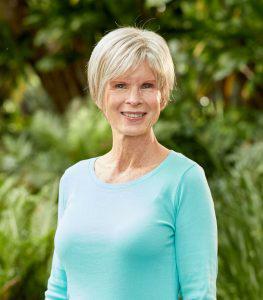 Over the decades, she has augmented her original recipe by mixing the flavors of Hawaii into new concepts and products. “I had to be crazy starting a granola business on Kauai in 1986. At that time, the only people who ate granola were a few hippies that made their own. But I was motivated by the people who loved Anahola Granola, who said, ’Your granola is so good you should sell it”. Some of those people bought a small bag every week. I couldn’t stop making the stuff; I thought, ‘What would my new fans eat?’ Obviously, I wasn’t motivated by crunching numbers and looking at the bottom line. It was never about the money. My vision of making granola was 100% clear. If fact so clear, it felt like every idea that popped into my brain was perfect. I never wavered from my direction, never over-thought my plan. “Tourism provides a huge advantage to starting a business on Kauai. Today, the typical tourist is seeking products that are unique to Hawaii. Visitors search for food and experiences that will make their trip special. They want to learn about the islands and enjoy the uniqueness of Kauai / Hawaii. Because of this, there is a lot of excitement in the community when launching a startup. When I started Anahola Granola in 1986, this was not the case. There were very few startup companies and the tourists liked hanging out at resorts isolated from the island culture. “There wasn’t a business ecosystem when I started. In 1986, there were very few startups. People would say, ‘If you can build a business on Kauai, you can succeed anywhere.’ Yes, having a business on Kauai presents a logistical nightmare. Especially bringing in key ingredients that you need for production.